nicely done indeed. must try out the curly carrot. unfortunatley am not accustomed to the taste of tempeh. Coffee too late does the same thing to me; I have to drink it only in the morning :) Love the katsuoboshi effect! So pretty! I love all of the colors and fantastic photography! I missed tempeh very much, too bad i never got a chance to get it here..
@sherimiya : ya Sheri ... I have to remember not to drink it in the afternoon :p Thanks a lot Sheri! 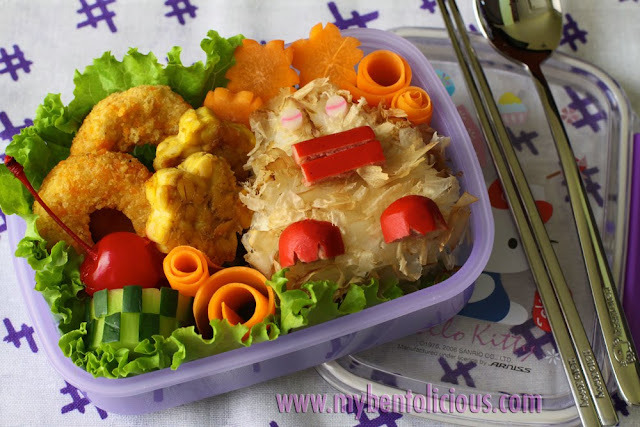 BTW your Bento is awsome as always, and the picture is fantastic. Tempe is actually easier to find at the natural health product stores here. One time, I found tempe at the Asian store here, it tasted awful! I stick to use the one from natural health product stores.